OLED display revenue expected to grow fro $25b to $50b. 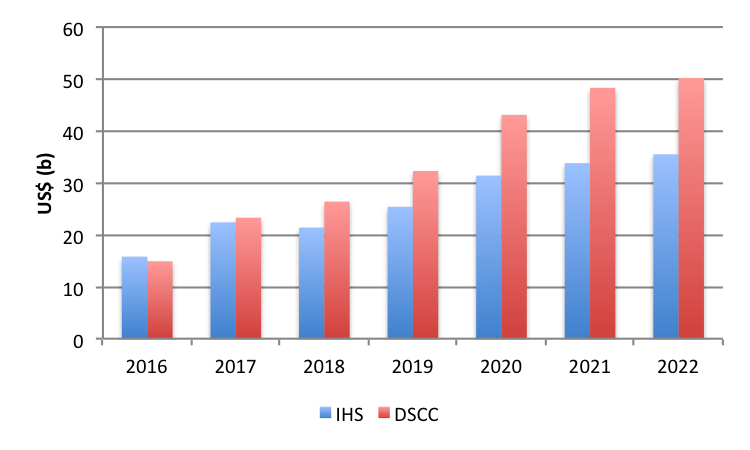 The figure below shows the difference between the DSCC and IHS forecasts. IHS was not at the conference. Expect Samsung’s foldable smartphone in 2019; but the volume is likely to be low, ~1 m units. If successful, Samsung could dedicate one or two of it A5 lines to the product. Samsung is working on a Hybrid TV, combining blue OLEDs and the associated common layers, which would be vacuum deposited with red and green PL QDs. 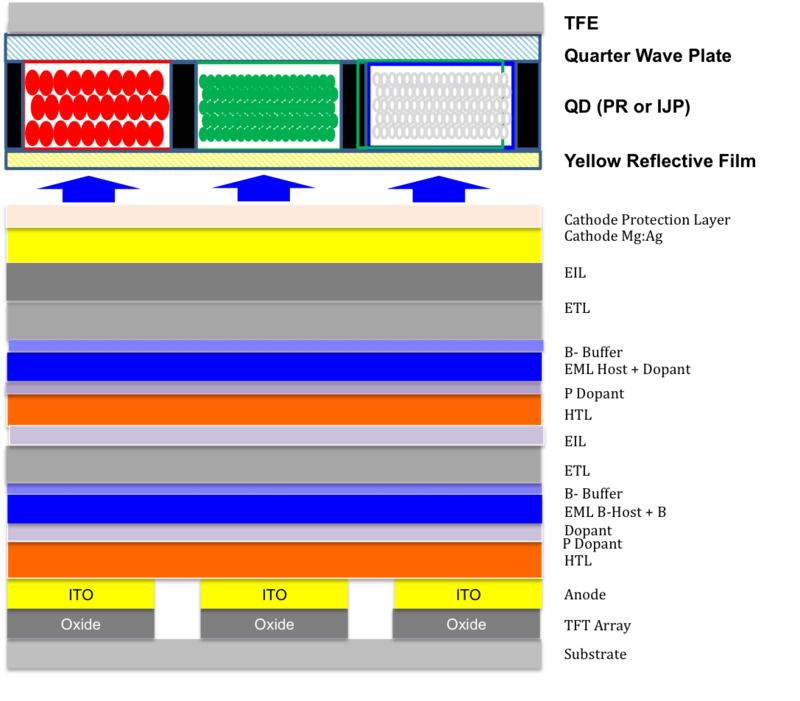 A stack schematic is provided to show the double layer fluorescent blue material. Several issues have delayed or possibly negated the use of QDs as a color filter for LCDs and may spill over to the hybrid approach. The question about the configuration is whether a color filter will be required. There are three main issues that might cause the use of a color filter. Cynora, Kyulux and UDC discussed the status of triple emitter blue material. Cynora claims they are now at 460 nm and could have a commercial supply in the market by mid 2020; Kyulux said they are at 470 nm with no target date for commercialization and UDC refused to discuss the subject, except that they are making progress. LG presented the status of their Gen 5 OLED lighting fab and were optimistic about the opportunity to solve some medical issues with OLEDs. Fraunhofer and the Holst center reported on progress using R-T-R manufacturing and again said it would be 25% less expensive than current manufacturing methods, but provided no backup to the claim. OLEDWorks was very optimistic about OLED lighting and claims that potential customers given the opportunity to see OLEDS vs. LEDs in an office environment will almost always choose OLEDs.